Since the weather warmed up nicely over the weekend and the hubby could get out to the grill, I decided to try another recipe from the newly purchased Recipes and Riffs cookbook. 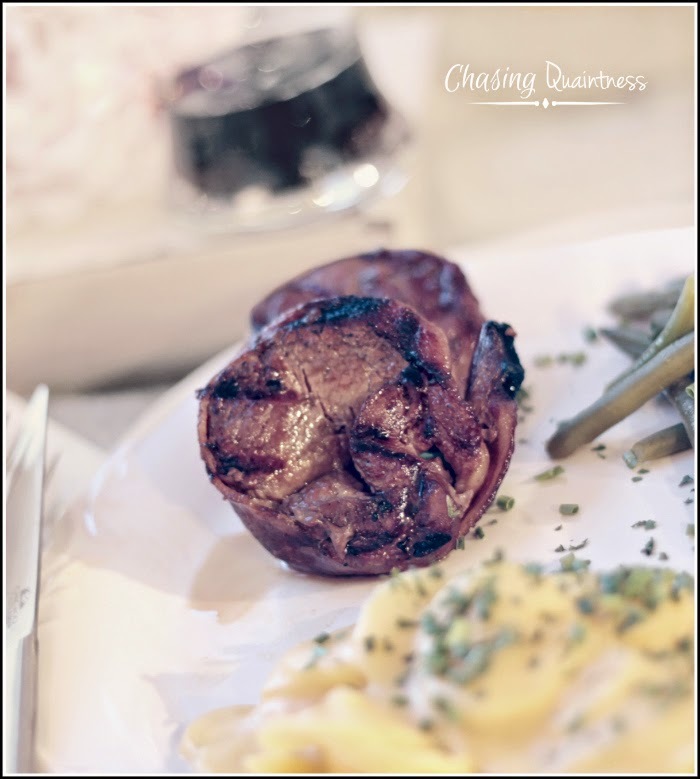 This time it was one of Chris Young's favorite recipes, COFFEE-CURED FILET MIGNON. According to some info in the cookbook, this is one of Chris's favorite "impress-a-date" orders when he dines at the Stoney River Restaurant in Nashville. The chefs, Jim Filaroski and Michael Sabrin, were kind enough to share the recipe for the cookbook. While the marinade looks a little complicated and time-consuming, I classify it at the beginner cook level because it's just that easy. If you can boil water, you too can prepare this marinade! I'm not a steak eater, so I had to rely on my husband for the flavor analysis. He said the flavor was excellent, with a little sweetness, but that you couldn't really taste the bite from the coffee. We both presumed the molasses and brown sugar balanced the taste of the coffee. 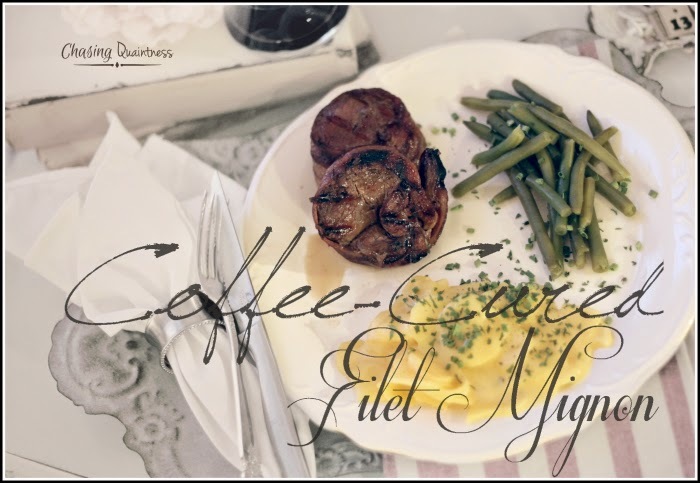 I served the steak with scalloped potatoes and haricot vert green beans. After dinner, he asked if we could have this dish again the next day. That makes it a keeper! Stir together boiling water and coffee in a medium bowl. Add sugar and salt, stirring until sugar dissolves. Stir in molasses and next 2 ingredients. Fill a large bowl half-full with ice and 1 cup water. Place bowl of coffee mixture inside ice-filled bowl. Cool coffee mixture to room temperature, stirring occasionally. Combine filets and marinade in a large zip-top plastic freezer bag, turning to coat. Seal and chill 2 hours, turning once. Remove steaks from marinade; discard marinade. Preheat grill to medium-high (350 - 400 degrees). Grill, covered with grill lid, 5 to 7 minutes per side or to desired degree of doneness. If you would like a printed copy of this recipe, please click here. Shared on From My Front Porch to Yours, French Country Cottage, Milas Little Things, The Honeycomb Home, No Minimalist Here, Between Naps on the Porch, Tatertots and Jello, Rattlebridge Farm and Cozy Little House! You are quite welcome! It is, according to my husband, a great blend of flavors! Thank you for commenting and stopping by! Have a great day! Yum! I wonder if this marinade would work with other cuts of steak as well! Thanks so much for sharing at Idea Box! Danielle, I believe it would. I haven't tried it, but it seems to be one of those marinades that would add flavor to several different types of meat! Thanks so much and have a great day! We are so glad you joined us at Thoughts of Home, and this recipe is a keeper. 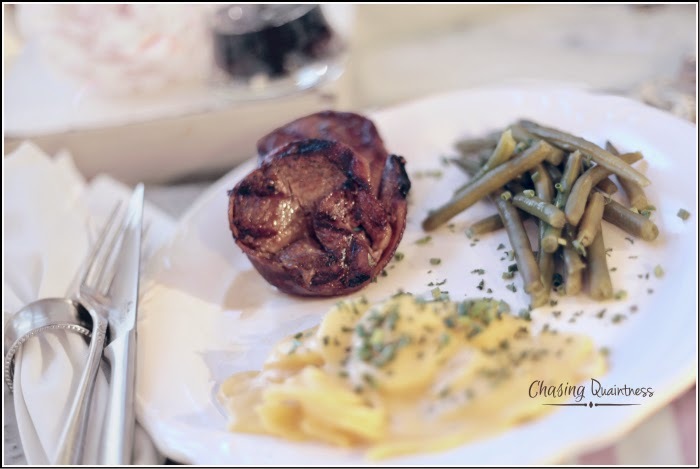 I loved the steak, fantastic recipe, but then I looked more closely and I swear it's bacon wrapped. Is there some unwritten rule that says the words "Fillet Mignon" means bacon wrapped or is it because I flunked French?